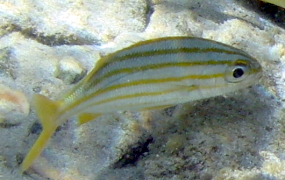 The adult Smallmouth Grunts are fairly easy to identify. 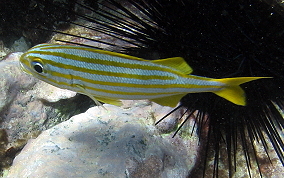 They are white to bluish white with 4-5 thick yellow to yellow-gold horizontal stripes that run uninterrupted from their noses to their tails. 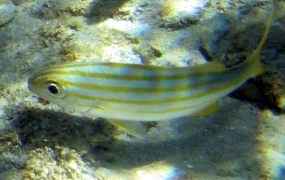 The juveniles look fairly similar, white bodies with horizontal stripes. 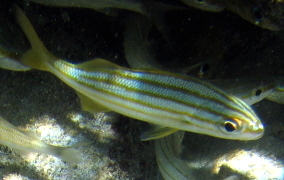 The eyes are very close to the mouth and the more elongated bodies (compared to the other grunts) are also indicative of the species. Maximum length 10 inches. A Smallmouth schooling with Tomtates.